The bioemsan Rose product line contains mild, caring substances with the scent of Damascus rose. Immerse yourself in the world of roses and let yourself be seduced. A sight so graceful and strong. Let yourself be pampered and enjoy the moment. 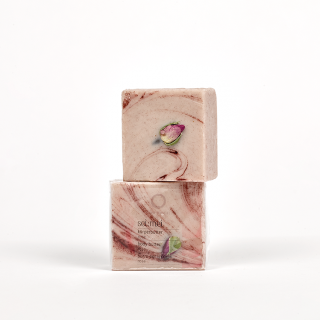 Enjoy the scent of Damascus Rose during gentle cleansing with mild detergent substances and caring ingredients. Already during showering your skin is cared for with valuable vegetable oils, it becomes soft and supple and no creaming is necessary anymore. Mild, caring substances with the scent of Damascus Rose. The naturally caring bioemsan shower gel Rose enchants body and senses. It envelops the body with a seductive scent and provides for a soothing relaxed skin feeling. The bioemsan Shower Gel Rose is a natural and effective shower gel due to its valuable caring ingredients. Shower gel and body cream in one. Feel the softness on your skin. 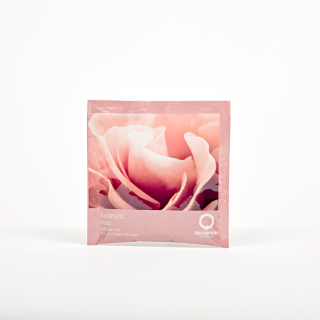 The wonderful wild rose cares for and protects your face from drying out. 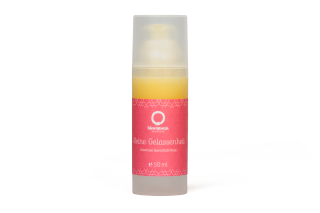 Apply to the face, neck and - if required - to the décolleté, morning and evening after cleansing and toning. Ideal skincare for combination skin is the bioemsan Cleansing Milk, together with a few drops of the Rose Facial Oil, used on a daily basis. Simply blend the two products in your hand and apply. The bioemsan Rose face oil sets clear signals and is a true beauty miracle. Especially when the temperatures drop, the skin needs treatment tailored to its needs. The soothing Rose facial oil helps the skin to normalise its sebum production. The tasting extracts of rose buds in jojoba, wild rose seeds and rose wax in composition with the Effective Microorganisms bring out the natural beauty of the skin with regular application. The scent of the Damascus rose in heart form. Simply soap and rinse with clear water, also suitable as facial soap for cleansing. The noble and delicately fragrant soap is suitable for mild cleansing of body, face and hands. Rosy fragrance caresses the senses and precious organic oils from milk thistle and castor bean as well as organic shea butter care. Apply to lips as needed and allow to absorb. Also ideal as a base for lipstick or as cold protection for the sensitive eye area. Coconut oil and beeswax nourish and protect your lips, shea butter makes them soft and supple. Wild rose seed oil is particularly precious and protects them from drying out. Ceramic powder and Manju Sea Salt provide intensive moisture and make them wonderfully shiny and velvety soft. The Lip Balm Rose is a blessing for your lips. The combination of - with EM-fermented - natural stone salt, high-quality vegetable oils, ceramic powder and selected fragrances is a feast for the skin and the senses. The high-quality Manju Sea Salt ensures particularly gentle cleansing and care, even for sensitive skin. Natural salt has the property of moisturizing the skin. of the skin and thus increases the natural elasticity of the skin. The soothing and harmonizing Effect on the entire organism brings beneficial relaxation. Soothing fragrance and smooth soft skin. Apply to cleansed skin and massage in the melted body butter. Removes calluses on elbows and feet. Supports against skin irritations and stretch marks and also protects sensitive children's and baby skin. The rich bioemsan body butter Rose cares for and soothes the skin. Valuable wild rose oils, Shea butter and cocoa butter harmonize and care for. Shea butter contains valuable ingredients such as allantoin, flavonoids, phytosterols, trace elements, flavourings and vitamins. Promoting flavonoids the renewal process of the skin cells. Vitamin E protects against free radicals, which are responsible for the premature cell aging are responsible. Vitamin A vitalizes the cornification process of the skin, phytosterols promote blood circulation. The bioemsan bath salts provide exquisite care in the bathtub through selected ingredients. Add approx. 1 tbsp bioemsan bath salt to the tub and let hot water run in. 1 sachet (30 g) is enough for two full baths. The combination of - with EM-fermented - natural stone salt, high-quality vegetable oils, ceramic powder and selected fragrances is a feast for skin and senses. 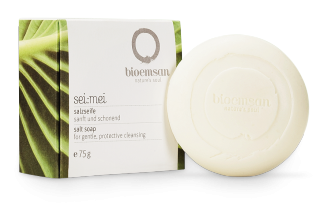 The high-quality Manju Sea Salt ensures particularly gentle cleansing and care, even for sensitive skin. Natural salt has the property to bind moisture in the skin and thus increases the natural elasticity of the skin. The soothing and harmonizing effect on the entire organism brings soothing relaxation.